Thank you for using ARK System's Waybill Tracking program. Use this guide to get a quick overview of the program. 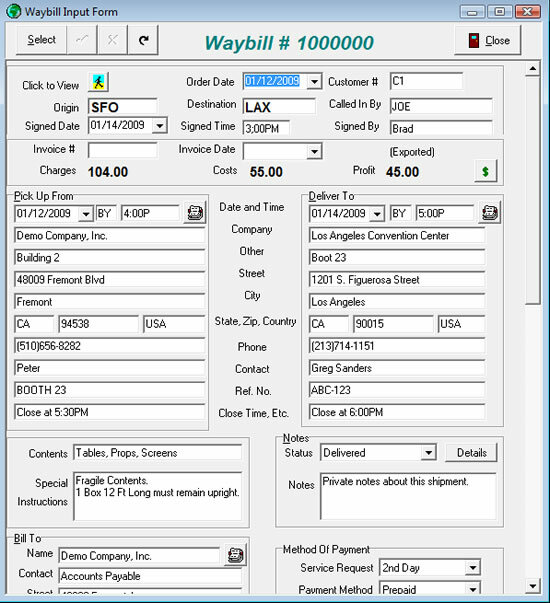 The "Select Waybill #" is the main screen you will use. In the Search field, type in a waybill number to find. Once you find the correct waybill, select it, then click OK or press ENTER. To enter your own Waybill number, click Add, type a number, and then click OK.
Search for a customer based on its number, name or phone number. Once you find or enter the correct customer, select it, then click Select or press ENTER. 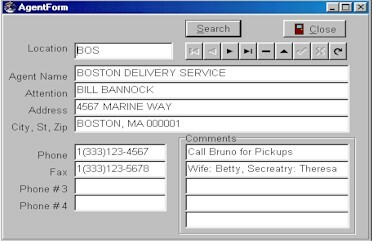 If you will be picking up from this billing customer and delivering to another address, the customer’s address will display in the pick-up box. Use the "Delivery" selection if you will be delivering the product to the billing parties’ location. A new waybill will be created with all the information you provided. When hovering the mouse over some fields, notes will appear in the Status Bar at the bottom of the screen - guiding you on how to enter the appropriate data. Dropdown lists, like the Pick Up From date field and the Notes' Status field, provide you with handy lookups to simplify data entry. This section allows you to add customers or edit existing ones. 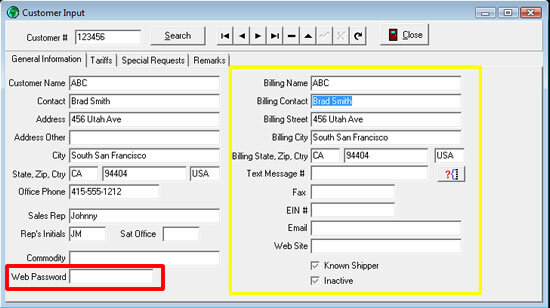 If the Bill-To-Name is the same as the Customer’s pickup / delivery address, leave the word SAME in the name field. Use the Web Password field (outlined in red) if you want the customer to access their POD data from the Internet. This requires the Weblink Module (purchased seperately). 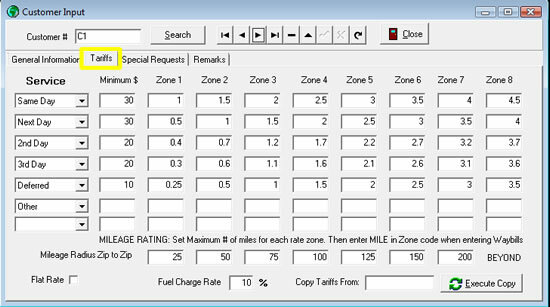 The Tariffs Tab (outlined in yellow) allows you to set rates for an individual customer. These rates are used when rating a waybill in the input waybill section. 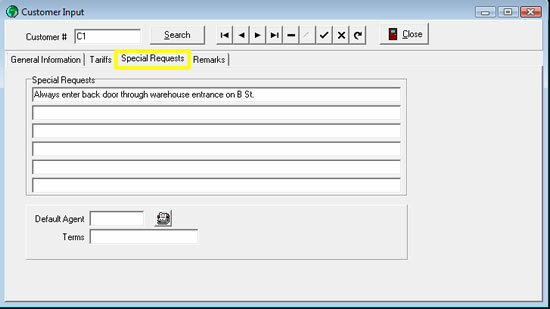 Special requests and Remarks pages allow you to track other information about this customer. There is also a special code line which is used for custom functions performed for certain customers. 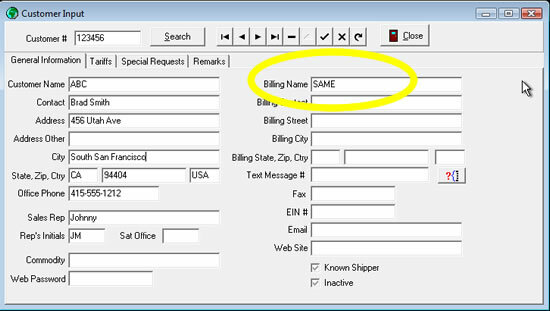 For instance, you can type "DEADBEAT" in this line and a flag will show up when entering a waybill for this customer. Click Close when you are finished with all additions. Agents can be either Delivery agents or Drivers. Input is very similar to customer input. You select the agent you want to edit on the Agent Search Dialog screen and click OK. Since m ost users select an airport code for the Agent account number, enter that code and click Add. The Airport Code is not a requirement, but you are limited to a five-character location number. Complete the agent information on the input screen. Click Close when finished. Once you have entered a Waybill, you can create various forms and reports. The best way to learn these is just to try some and see which ones fit your business needs the best. Logos and information on reports can be customized, if needed. When printing a form or report, you can change printers by selecting the Printer Setup button. See our FAQs for detailed information on how to do that.